Our church is situated in the heart of the Connecticut river valley. For over 50 years the residents of Lyme, Connecticut have gathered at 1 Sterling City Road (directions) to hear the word of God and connect with their community. Our town is best known locally for its wandering roads, beautiful farms, and generous people who bring the church to life. We invite you to join us on Sunday at 10 am as we worship and explore the workings of God. We also actively share what’s happening in the congregation on our events calendar so you can stay present. As we move into the 21st century we hope to honor our history by continuing to connect and educate our community under our church’s roof and everywhere God is working. Call to Worship Leader: The peace of God be with you today. Receive with joy the gift of the Holy Spirit. People: We feel the winds of God blowing among us. We sense the tongues of fire empowering us. Leader: God calls us to be dreamers and prophets. God give us a vision for a world of peace. People: May the glory of God endure forever. We will sing praise to God as long as we live. – Aug. 10, 2014 Bulletin, “Fairy Gardens” Located at the corner of Route 156 and Sterling City Road in Lyme, Connecticut, our church gathers every Sunday at 10 am to worship and come to know God better. The church is part of the Connecticut Conference of the United Church of Christ and declared itself to be Open & Affirming in 2011 with the following statement: We, the members of the First Congregational Church of Lyme, CT, interpreting the Bible in the context of its time and following the teachings and example of Jesus, declare our church to be an Open and Affirming church, actively expressing Jesus’ inclusive embrace of all people. We acknowledge God’s acceptance of every individual and Jesus’ commandment to love one another. Therefore, this church welcomes heterosexual, gay, lesbian, bisexual, and transgender individuals to worship and enter into the full life and ministry of our church. In our community of faith, all people are encouraged to participate and share their talents and energy in worship and sacraments, leadership positions, ordained ministry, lay ministry, learning, service, mission, and fellowship. 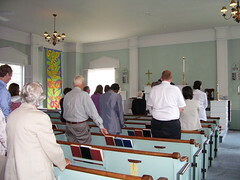 Further, persons of every gender, mental and physical ability, age, race, nationality, economic and social status, faith background, marital standing, and family structure are welcome in our church community; and the First Congregational Church of Lyme invites all to share in the life, leadership, ministry, fellowship, worship, sacraments, responsibilities, blessings, and joys of our congregation. We are residents of Connecticut. … we are citizens of the world.